Panchmarhi is the only hill station present in the state of Madhya Pradesh. It is located at a height of 1000 m in the Satpura Range and hence commonly called “Satpura ki Rani”. It is a small town with quite less population. It is a popular spot for tourist all throughout the year. A bazar is located is the small town of Pachmarhi where most of the retail shops are present. The beauty of Panchmarhi is remarkable and picturesque with thick green forests and flowing streams with wonderful waterfalls and the breathtaking view from the hill that stands atop the town. It is also rich in wildlife due to the natural environment and less population and construction. 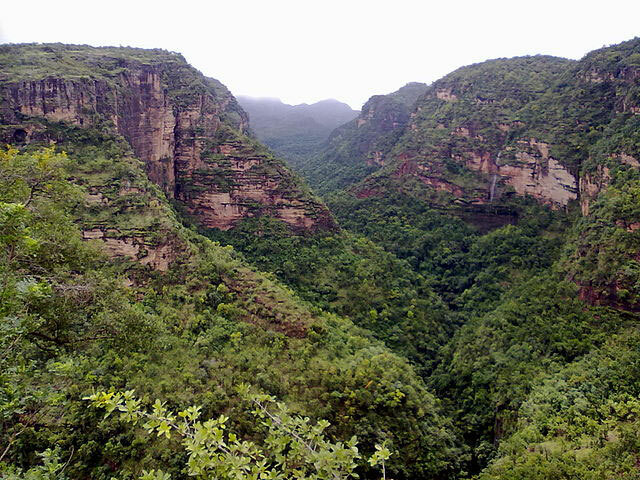 Pachmarhi is abundant with rich flora and fauna and tourist here feel absolutely relaxed and at peace. Bandhavgarh national park is known to be one of the most exotic wildlife destinations in Central India. The best time to visit this park is from the months of November to June. One can avail the facility of jeep safari to take a tour around the forest. The park is abundant with flora and fauna. It has the highest population of tigers in India and was also declared as a tiger reserve in the year 1993 under “Project Tiger “. The other animals spotted in this forest are wild boars, hyenas, jackals, chinkaras, spotted deer and leopards. There are a number of valleys and slopes in the forest which make the park look very beautiful. Situated in the Sailana Palace in the town of Ratlam, Cactus garden is one of the most famous and popular sightseeing attraction among tourists. It is a relatively new garden which was established around 50 years back in the premises of Sailana garden which is roughly 200 year old now. This garden features a wide variety of different species of cacti of various colors sizes and shapes. There are Indian varieties as well as species which have been brought from different countries. Few important species in the cacti family namely bulb cactus, snake cactus, peacock feather cactus and bell cactus are all displayed in this garden. Another attraction of this place is its culinary tradition. Kharmour bird sanctuary is located in Sailana village of Ratlam town and hence many a times also referred to as Sailana bird sanctuary. It was founded in the year 1983 and sprawls across an area of 13 sq kms. The most famous attraction of this sanctuary is the rare Kharmour species of bird whose home belongs in this very sanctuary. This sanctuary also hosts various migratory birds who halt here for a brief stop. The ideal time to visit this sanctuary to see a variety of birds would be from July to September. Also known as the Saroj Sarovar Dam, Dholawad dam is a major tourist attraction and is a must visit place in Ratlam. It is located in Raoti which is at a distance of 25 km on the west of Ratlam. The scenic views that one gets near the dam are simply breathtaking. People love to watch the sunset and enjoy the cool breeze and serene atmosphere. It makes for a perfect getaway for picnics or for relaxation away from the hustle bustle of the city. Winters are the ideal time to visit this dam. Ratlam is a perfect place for a quiet getaway to de-stress oneself and get some quiet and peaceful time. A paradise for the nature lovers, this place is a must visit for those who admire flora and fauna and love to relax in the peaceful valleys and hills.